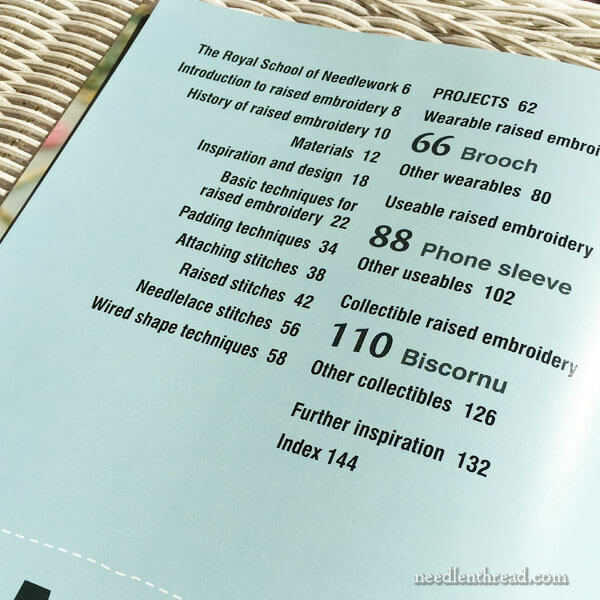 Time for a thorough review of an upcoming book – the newest in the Techniques, Projects, and Pure Inspiration series from the Royal School of Needlework and published by Search Press. 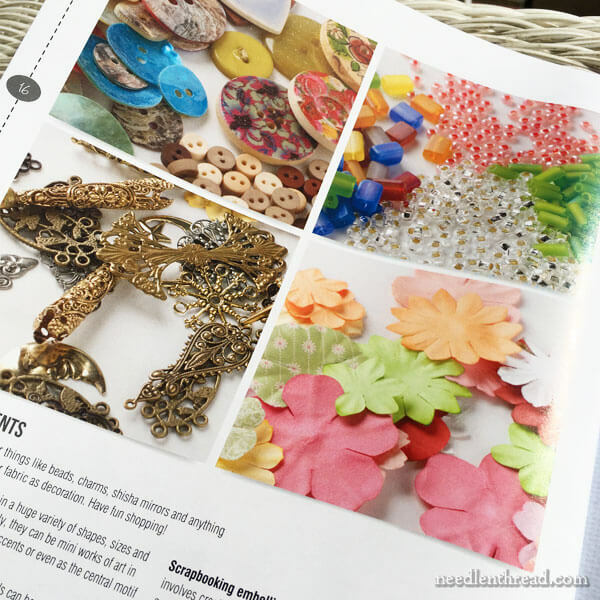 Ever since Appliqué: Techniques, Projects & Pure Inspiration – the first book of the series – came out last year, I’ve been looking forward to this one! 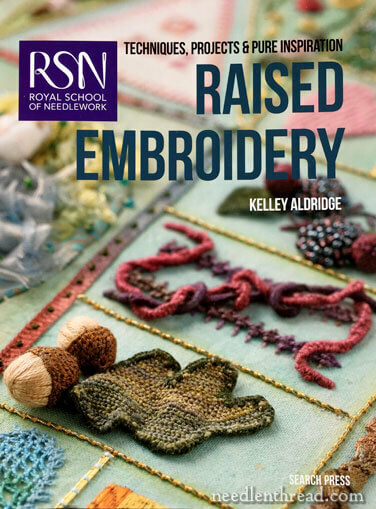 So, come along – let’s explore the ins and outs of Raised Embroidery: Techniques, Projects and Pure Inspiration by Kelley Aldridge. 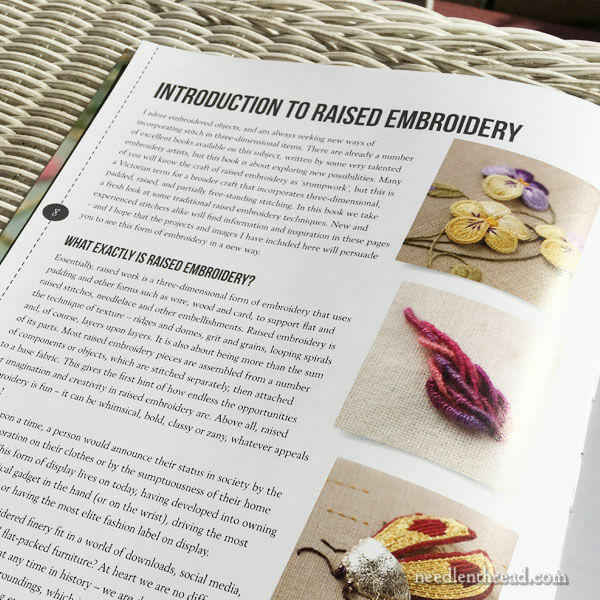 Raised Embroidery is a large format, paperback book. It opens up and lies flat, though, which is always nice with an instructional book. While many folks like to have their instructional books rebound into spiral binding so that they can lie flat while working from them, I don’t think this one really needs it. It’s large, not too floppy, but opens up just fine. I love what’s going on on the inside title page of the book! And here, you get a good sense of what the book is about. In case you’re expecting another needlework book focusing solely on stumpwork, this book isn’t really that kind of book. In this book, raised embroidery is used as an umbrella term, including the wired embroidery elements often seen in stumpwork, but also including lots of textured and dimensional stitches and techniques. 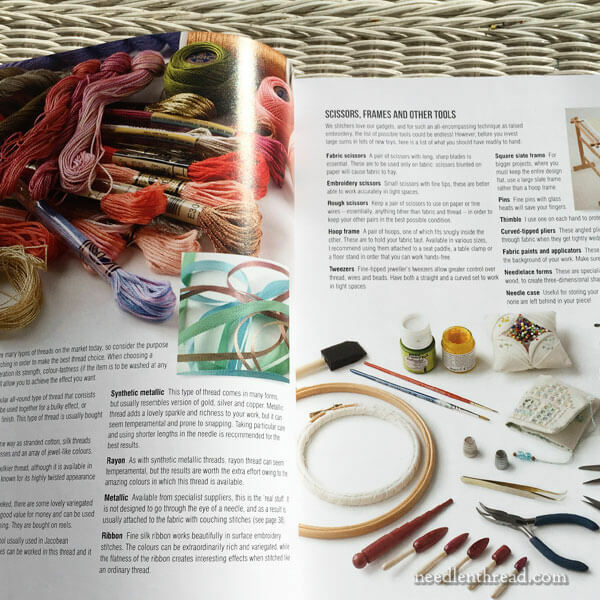 The table of contents gives you a good idea of what the book is all about – lots of stitches and techniques, plus a section of projects on which to put them to use. The book begins with the preliminaries: information on the Royal School of Needlework, on raised embroidery in general and on its history in particular, and an overview of materials used in raised embroidery techniques. I’m always entranced by the materials sections of needlework books. It’s fun to see what materials are recommended for different techniques, and I always learn about new things to try! Found objects, silk flowers, ribbons, buttons, beads, jewelry findings – all are fair game for raised embroidery techniques! 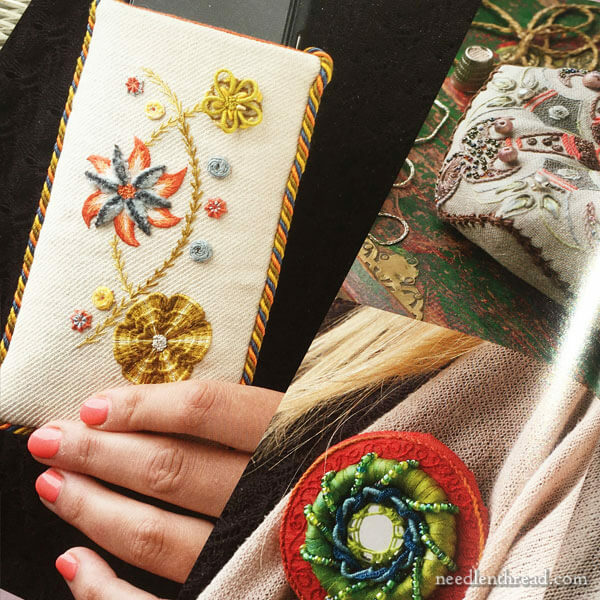 So if you like to fiddle with embellishments and pretty things, raised embroidery may definitely be right up your alley! 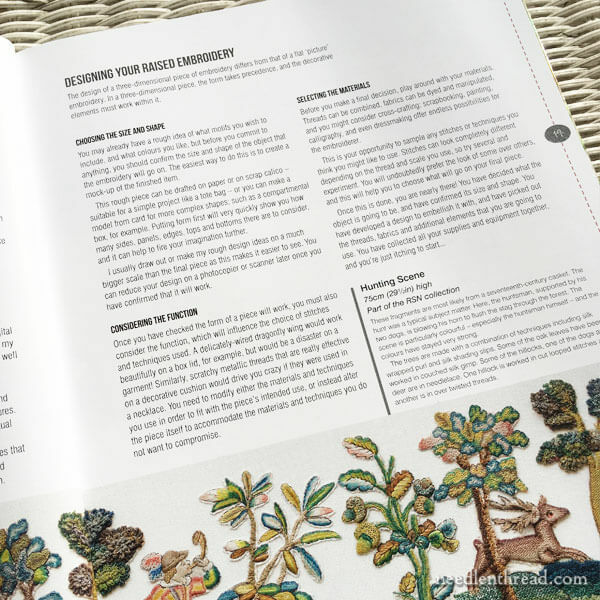 There’s a good section on designing raised embroidery projects, too. This is very helpful for those who want to do a project, but prefer to start with their own concept rather than copy someone else’s design or execute a project from a kit. 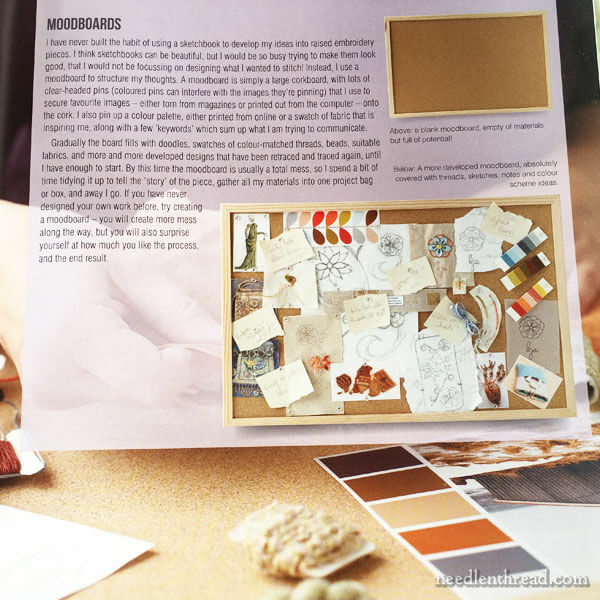 A mood board is essentially a place where you can pin up your ideas for a project, all collected in one place, so you get a sense of color, design, placement, and the whole “mood” of the project. You can add to it, subtract from it, and get an overall idea of the feel of the project as it develops. A lot of people use journaling for the same concept, but I like this idea of a completely visual mood board – it keeps the ideas right in front of you, available for manipulation the moment inspiration strikes. 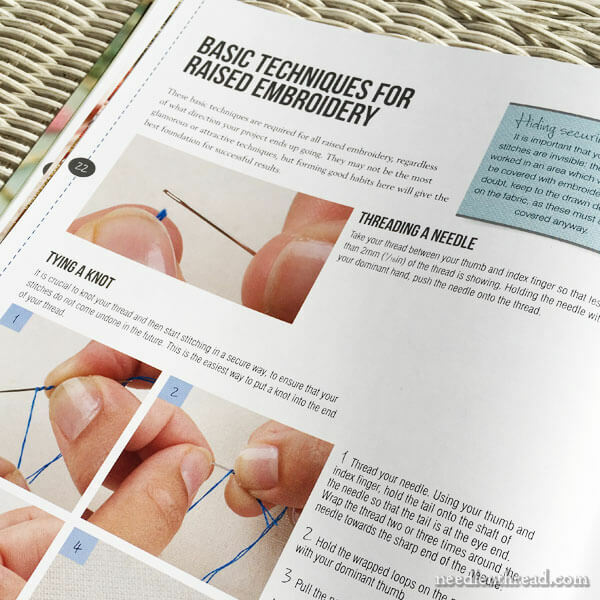 The instruction in the book ranges from very basic, beginner instructions all the way through to more complex stitches and techniques, making Raised Embroidery suitable for very beginners and beyond – all the way up to advanced stitchers looking for ideas and new things to try. 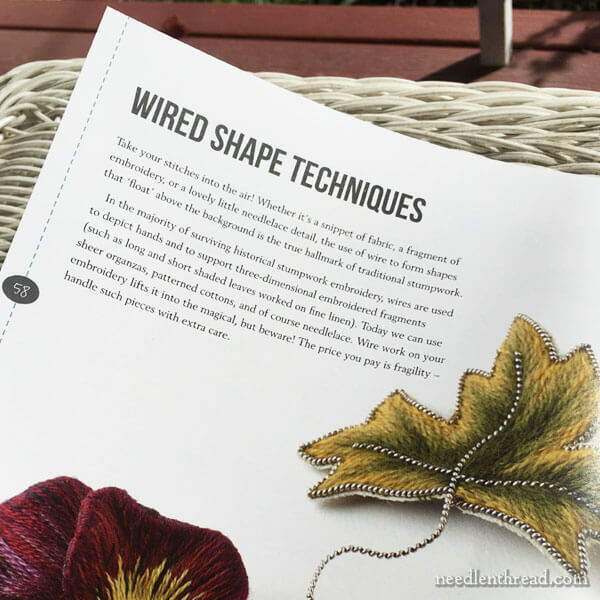 …to creating and using embroidered wired shapes, you’ll find all the instruction you need to excel at raised, dimensional, and textured embroidery. The second part of the book is devoted to projects, and most of these are usable projects, rather than simply decorative. 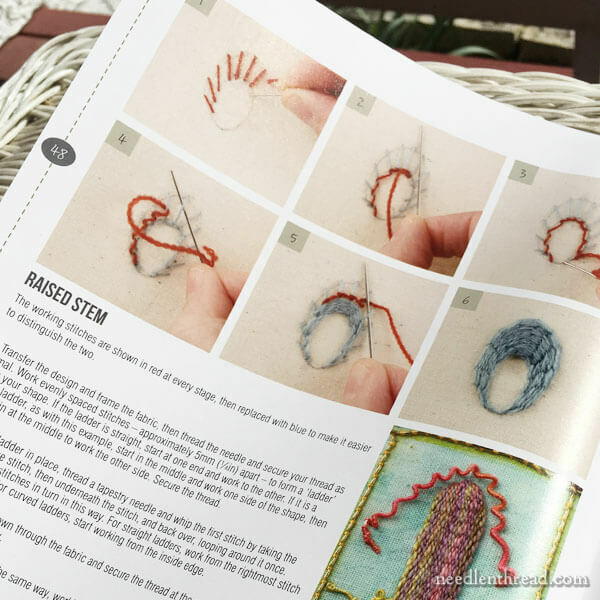 I always love it when books include finishing ideas and instructions, to make embroidery projects that are not just beautiful, but useful, too. 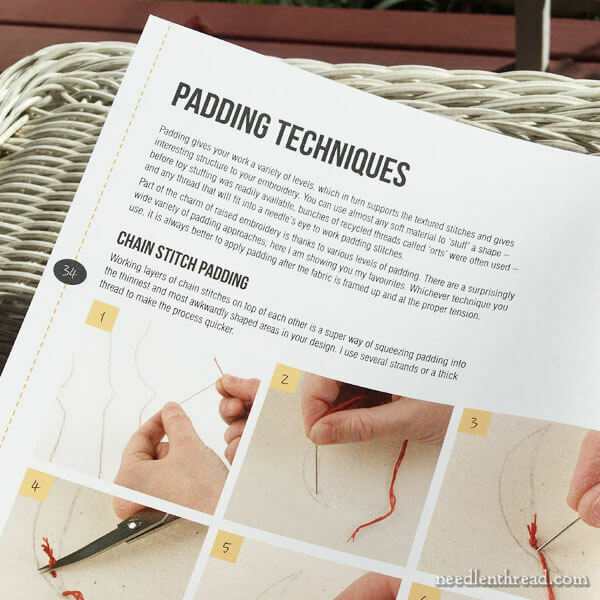 The instructions for the projects include patterns, materials lists, and step-by-step guides to stitching and finishing. Finally, throughout the projects section, you’ll find inspiration scattered all over the place. Pictures of all kinds of unique raised embroidery projects – some by the author, some by other stitchers – will whet your whistle and get the Idea Juices flowing! Raised Embroidery: Techniques, Projects & Pure Inspiration is exactly what the title promises it to be. You’ll find instruction, projects, and plenty of inspiration to get you stitching and keep you stitching! I like it. It’s pleasant to read, fun to explore, and it’s full of great ideas! 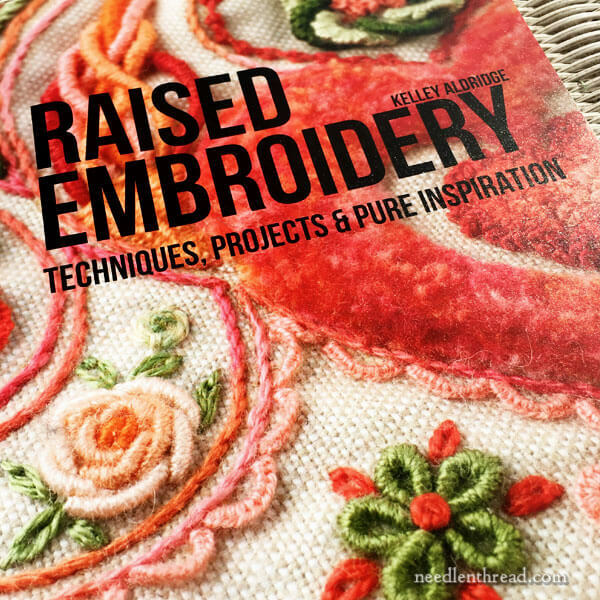 You can find Raised Embroidery: Techniques, Projects & Pure Inspiration available for pre-order through the following book affiliates. The book is due for release in June. In the US, you’ll find Raised Embroidery available here, through Amazon. 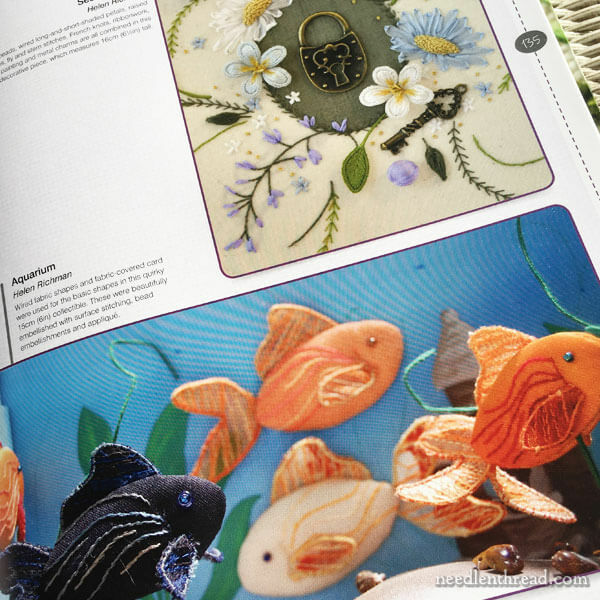 Worldwide, with free shipping, Raised Embroidery is available here, through Book Depository. Monday, we explore linen – and not the kind made for embroidery, either. But it might serve some good and useful needlework purposes (and it’s relatively inexpensive), so it’s definitely worth chatting about! I’m stitching on that book cover I told you about on Wednesday. Despite the outcome, I promise to share it with you. It’s…. not turning out quite as I would have liked, but hey, that’s what I get for a rush job! Raised Embroidery Techniques book certainly contains a lot of interesting ideas on raised embroidery and the contents of the book are very tempting to try. I like the usable project idea and I really interested in the mood board what a good idea you can see, feel, touch your ideas in one place and change when the mood takes you, a good technique. I have a few RSN books and they are really good, so this is definitely going on my list. 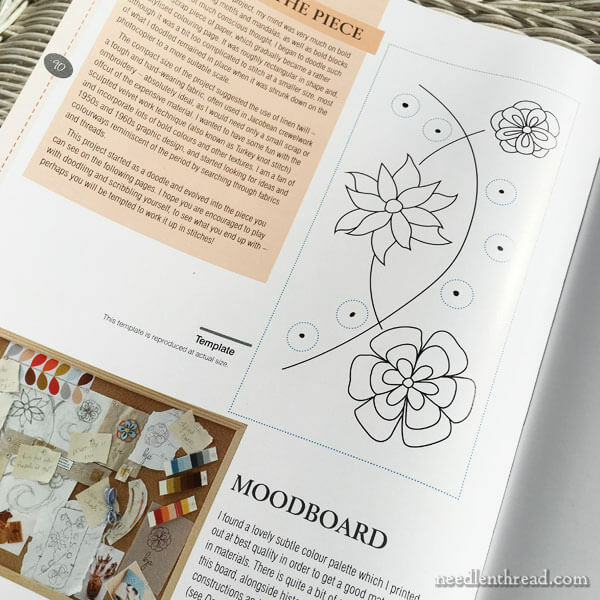 I’m looking forward to the up and coming posts and thanks for sharing Raised Embroidery Techniques book with and for the lovely photos. I hope you manage to get the Holy Communion book cover completed by the deadline. Have a good weekend. Thanks, Mary! I hope someone buys me this book for Christmas. Thanks Mary! Your reviews are so helpful. I’m constantly reading and re reading parts of your blog. You have created a fabulous resource. Thank you! I came across this book while searching for something else and thought it looked interesting but there wasn’t much information about the contents. So my first thought was “I wonder if Mary Corbet has reviewed this.” And, ta-da, you had! Thank you for your continued review of books, I find them so useful! Obrigada por socializar seus trabalhos e sua experiencia. Seus posts sao elucidativos e os videos muito didaticos. Eles orientam e contribuem para o desenvolvimento de nossos projetos. Sua presença no Pinterest é valiosa.